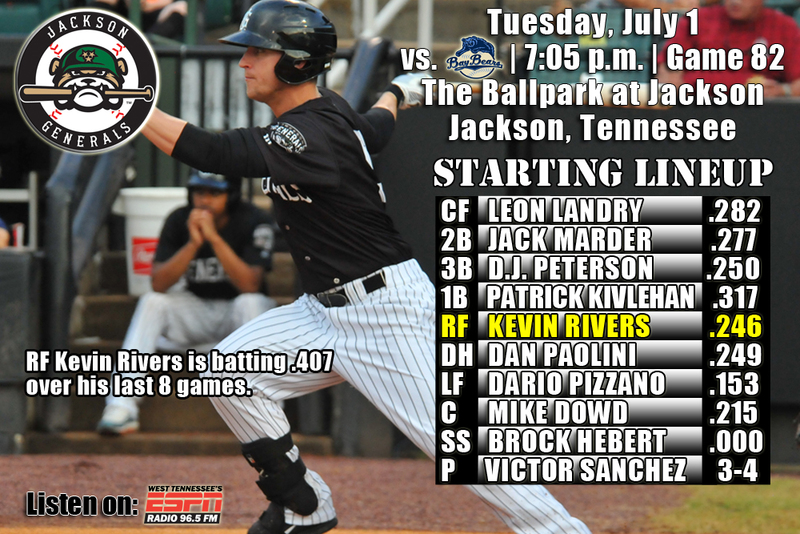 • Tonight the Generals continue the 10-game homestand (1-6) with game three of a five-game series against Mobile (0-2). The Generals went 1-4 against Tennessee in the first leg of the homestand…are 3-9 against Mobile this season. • The Generals held a 3-0 lead after 4 innings and a 5-4 lead after 8 innings, but it wasn’t enough as Jackson fell to Mobile 6-5 on Monday night. • 1B Patrick Kivlehan (3×4, R, RBI, BB) led the team with 3 hits, while C Johns Hicks (1×3, R, 2 RBI, BB), CF Leon Landry (1×5, R, 3B, RBI, SB) and SS Ketel Marte (1×5, R, RBI) combined to drive in 4 runs. • Starter Stephen Landazuri (4.1,5,3,3,2,3) tossed 4.0 scoreless innings before allowing 3 runs in the 5th inning to record a no decision. LH Nick Hill (0.2,2,1,1,0,0) allowed 1 run in the 5th inning, while LH Cam Hobson (2.2,4,0,0,1,2) tossed 2.2 scoreless innings in relif. RH David Colvin (1.1,1,2,2,1,2,HR) recorded the loss after allowing a 2-run home run in the top of the 9th inning. • Hitter turned Pitcher – Jackson opening day 3B Ramon Morla is now pitching for the Rookie AZL Mariners and has allowed only 2 hits, while walking 1 and striking out 3 in 4.0 scoreless innings in 3 releif appearances touching 98 MPH. • OF Julio Morban has hit safely in 7 of his last 8 games, batting .387 (12×31) with 3 runs scored, 2 doubles, 1 RBI, 1 triple and 2 walks. • OF Leon Landry has hit safely in 17 of his last 19 games with 10 multi-hit efforts, batting .384 (28×73) with 12 runs scored, 4 doubles, 3 triples, 5 RBI, 3 walks and 8 stolen bases. • OF Kevin Rivers has hit safely in 7 of his last 8 games, batting .407 (11×27) with 3 runs scored, 4 doubles, 1 home run, 3 RBI and 3 walks. • C John Hicks has hit safely in 10 of his last 12 games, batting .341 (15×44) with 7 runs scored, 4 doubles, 5 RBI, 5 walks and 2 stolen bases. • Jackson finished 12-14 in June, but posted a a .294 AVG which ranked 2nd in the league and 6 Generals batted over .300 in June. • The Generals played their fourth straight 1-run game on Monday night (1-3) and dropped to 5-12 on the year in 1-run games. • Jackson has dropped 21 games this season after holding a lead including three of the last four. • D.J. Peterson, the No. 2 prospect for the Mariners, according to Baseball America and was Seattle’s 12th overall selection in the 2013 draft out of New Mexico. He has hit safely in all 5 Jackson games he has appeared, batting .250 (5×20) with 1 run scored, 1 double, 1 RBI and 2 walks.